See attached PDF report from Raymond James research. Over the past several years, EIA data suggests that U.S. operators have built up a tremendous inventory of Drilled but Uncompleted wells (or DUCs). Unsurprisingly, this has led to investor concern about a potential onslaught of U.S. production from wells that are simply awaiting completion. In our view, this U.S. DUC phobia is no Avian Flu and the problem is way overblown. After a closer examination of the DUC data, we believe the level of "abnormally high" DUCs is FAR lower than the public data would imply. In today's energy stat, we take an in-depth look at the U.S. DUC inventory and show why current U.S. DUC levels are actually close to where they should be and do not represent the U.S. oil production surge threat that some believe. 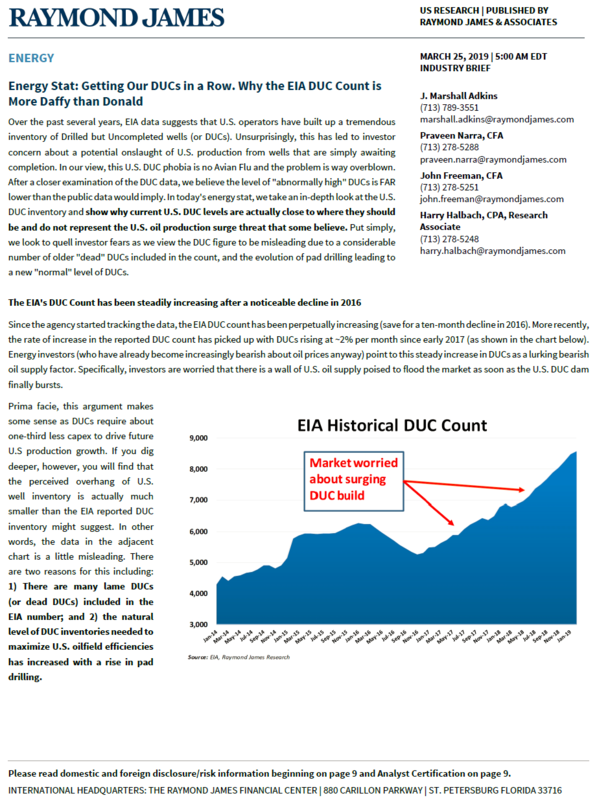 Put simply, we look to quell investor fears as we view the DUC figure to be misleading due to a considerable number of older "dead" DUCs included in the count, and the evolution of pad drilling leading to a new "normal" level of DUCs. The Midland bbl price is at major discount to the WTI price. Those with contracted capacity on pipelines out of Permian have been buying Permian discounted oil and selling in Gulf for a handsome profit. The discount to Cushing WTI has been as wide as $15. Can't get oil out of Permian. The three new pipelines have firm commitments contracted for. I don't buy Raymond James theory. Some analyst sitting in a Manhattan office comes up with theory with no hard facts to support. I question that. My checks show huge DUC inventory. While I was in Ft. Stockton I inquired about all the supposed DUC wells and one driller was spot on saying in essence that they are drilling 2+ holes before 1 gets completed. Would stand to reason with 870 rigs hammering wells in 30 days or less how the DUC's could pile up in 2 years time. One can also imagine tight holes might get passed over as tech has found easier holes to frack and get completed with a true return on investment. A lot of "dead" non-completed holes doesn't mean they wont be, after all, the cost of each hole in last 2 yrs average 10 million+ so it would be safe to assume they'll get completed....just not enough equipment or man power. When I left 3 weeks ago it was slowing down except a few hot areas of easy pickin's. Time will tell, but the service companies are running full bore. It's not lost money till they cement the well shut.....then it's truly DEAD. A question too is what percentage of those DUC's figure into the child/ parent configuration. I'm inclined to believe quite a few are offset wells. I can add to this as well. All 7 of my new wells which have been producing since January are still in the DUC category. The operator files a completion report that says the initial production hasn't yet been tested and the well is awaiting production. This status remains even if the well is completed, until the operator files an updated W-2 with the IP flows. In some cases this takes over a year to see the filing. Some operators have their wells in pending category, neither oil or gas while waiting to classify the well. In Texas that depends on the GOR which can take a while to stabilize. There are benefits to having your well classified as a gas well instead of an oil well so the operators wait to make sure the well is an oil well. In the meantime, the well is producing and it's still classified as a DUC for the purposes of these kinds of analysis. In fact, my independent operator finally moved the well he drilled in Sep 2017 into the gas well status and filed the final completion report in January of 2019. The IP was measured on 11/11/17 at 1032 bbl oil/day and 3827 mcf gas per day which makes it a gas well but he left it in pending status for over a year. The final reports just started showing up and in the meantime, while the well was making it's best production, it was for the purposes of these kinds of analysis, a DUC for a full year after it started PPQ. Many times as well, an operator will use a DUC to "hold the lease for production"
Raymond would have us believe that 30% of current and future wells won’t be fracked? Is that why the shale industry is in debt? Weird that there is so little reporting on such a massive amount of money that has been invested wether these wells are fracked or not. True backlog or extreme incompetence or both. Maybe this will turn out like the housing crisis that almost took down the worlds economy. Curious what producers tell banks about these DUCT’s as they reapply for loans. What do you mean by hold for production? I would assume you mean HBP (held by production) in which case the well has to be producing to hold the lease. No lease is valid past the primary term without production and a DUC won't do that. Of course if there are other producing wells then the DUC is irrelevant to HBP. While I was in Ft. Stockton I inquired about all the supposed DUC wells and one driller was﻿﻿ spot on saying in essence that they are drilling 2+ holes before 1 gets completed. Would stand to reason with 870 rigs hammering wells in 30 days or less how the DUC's could pile up in 2 years time. One can also imagine tight holes might get passed over as tech has found easier holes to frack and get completed with a true return on investment. A lot of "dead" non-completed holes doesn't mean they wont be, after all, the cost of each hole in last 2 yrs average 10 million+ so it would be safe to assume they'll get completed....just not enough equipment or man power. When I left 3 weeks ago it was slowing down except a few hot areas of easy pickin's. Time will tell, but the service companies are running full bore. It's not lost money till they cement the well shut.....then it's truly DEAD. I've seen well costs btw $6 to $8 million each. That includes completion. Drilling the hole is estimated at about 30% of cost. Approx 70% is the fracing. The small/midsize operator's need to keep producing . . . They can't sit on DUCs. then for rig count purposes, where do these show up? Yes sorry, held by production. May just be an Oklahoma thing, where discovery is enough to extend a lease, production is not necessary. Nowhere, the rigs have moved on by then. The wells are drilled, completed and in production but still listed as drilled awaiting production. WOW, you're kidding! I have never signed a lease that allowed the minerals to be held without production. Even the 10 year primary term lease my ancestors signed in 1950 didn't allow that. Many leases would have some primary term left after the well is drilled. If there is no primary term left after the first well is drilled, there is a continuous operations clause in most every lease that provides for at least 90 days to do more work and if the operator has a problem, they can possibly claim force majeure or possibly lack or market or waiting on pipeline. If the well is completed, but not producing, (rare) they can claim waiting on pipeline or lack of market and even use the shut-in clause to extend it for years. Yes but that isn't what we are talking about here. A DUC doesn't have proven production. The language refers to wells that have been completed but shut in because of a lack of a market but not having a pipeline generally isn't considered lack of market. In the case of gas wells that can be true but if it produces oil they generally don't shut the well in. Most shut-in royalty clauses only allow a maximum of two years but you are right, there are several clauses that can temporarily extend the lease beyond the primary term but that's not what I was referring to. The other thing to mention here is that a lease is a negotiation and you don't have to allow those clauses to be included or you can limit them. There is a lot to negotiating a good lease. What YOU do or suggest Lessors do is irrelevant to this conversation. What is relevant is what do 90+% of all Lessors do. And what 90+% of them do is they have those clauses in their leases. IMO, if a Lessee has a potential legal problem with his situation primary term, a DUC or no DUC and with the verbiage in his lease, he is going to complete the well and do so within the framework of a legal continuous operation or he will ask his Lessors to grant him a written and recorded lease extension. If he has no pipeline with a ready tie-in, he'll shut it in after completion. He is not going to risk $6 to $10 million. Unless he is Chesapeake. If so, all bets are off. so you're saying, just so I understand, that there are rigs in production that are not counted in the active rig count figure as reported by Baker Hughes? No, I guess I misunderstood your original question. What I am saying is that the rigs are no longer working on the DUC well. They are off drilling another well. The two are unrelated. One rig can drill multiple DUCs. A DUC is not completed. That is where we are at here. The other stuff doesn't apply unless the well was completed. You can't just drill a hole and claim production to hold the lease. A lot of money sitting on drilled but uncompleted wells. So I ask again, is this where most of the debt is buried? Why would any industry pay for 9,000 wells and drill for more. Every month lets say 75 to 175 more idle holes costing 10’s of millions. Because DRILLING in today's world is just about the cheapest part of the well. When you drill, you address the viability of FRACKING. Drilling itself is not bad as it helps you map the subterranean geology so your next well is more economical. As WRS said and others... how many of those DUC's are shut in verses, possible extraction points. There's a lot of discussion about holding the leases with production. Correct me if I'm wrong, but don't you only need One well to do that? If you drill another twenty wells but don't complete them for whatever reason (one holdup was a six month backlog on fracking), you still hold the lease.